A deluxe, contemporary, self-catering Apartment situated in the heart of North Berwick, overlooking the High Street and with views of the Bass Rock from the Master Bedroom. Consistently Awarded 5* by Visit Scotland each year since our launch. East Lothian, on the east coast of Scotland, is famous for its stunning rolling countryside, miles of magnificent coastline, golden sandy beaches and award winning attractions and golf courses. East Lothian hosts an impressive variety of attractions including the award winning Scottish Sea Bird Centre in North Berwick, the National Museum of Flight, Dirleton Castle and Tantallon Castle. Golfers are well catered for. 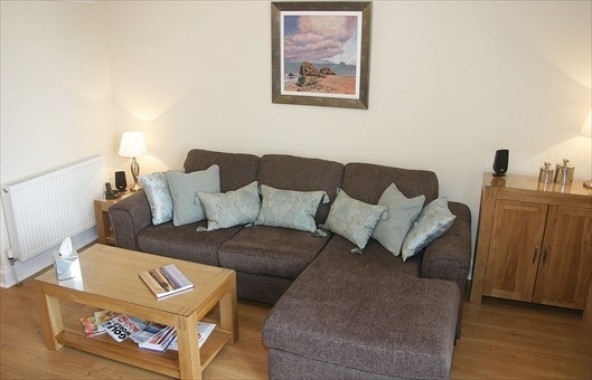 Our Apartment is in close proximity to a number of championship courses including Muirfield Golf Course (who proudly hosted the open championship in July 2013) and Gullane Golf Club who are hosts to The Scottish Open in 2015. There are over 10 courses in the region just waiting for you. Many suggest that this part of Scotland has a unique micro climate with more sunshine hours per year; certainly weather data does seem to back that up! The area is very popular with golfers, cyclists, ramblers, photographers, artists and countless more who enjoy beautiful surroundings, scenery and wildlife with charming villages, historic houses and castles. Don’t forget that beautiful Edinburgh, capital of Scotland is only 20 miles away (30 minutes by car or can be reached direct from the regular trains that stop at North Berwick station). The Apartment primarily sleeps 3 in 5 star luxury (king size and single bed) but can accommodate an additional small child by utilising a solid oak bespoke trundle bed (suitable for small children only as is 2.5ft wide by 5ft long). Baby Travel cots are also available upon request. 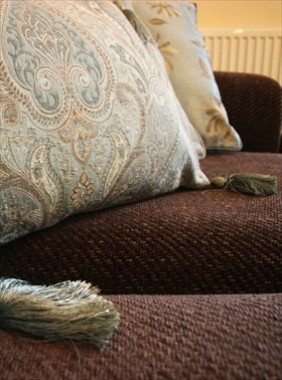 The Large luxurious lounge area is fully equipped with everything needed for a perfect holiday. Featuring a 50" 3D HD Plasma TV and Blu Ray DVD with Satellite TV, Home Cinema, Surround Sound, Wii console, Wii Board and games, Free WiFi and Free UK landline telephone calls. The Lounge also features ample seating including an electric leather recliner in the reading corner by the large window and large sofa/chaise for the ultimate in relaxation. Solid Oak furniture throughout property with oak flooring, Games, both board and electronic, reading material and other entertainment materials all provided. We also provide toys for children. The fully equipped kitchen is just like a home from home having a gas hob, double electric oven, dishwasher, integrated full size fridge-freezer, microwave, slow cooker, Hahn cookware, a kettle, toaster and coffee maker. Also included are all the necessary items to allow you to eat at the Apartment in style including Denby crockery, heavy gauge cutlery and Edinburgh Crystal glassware. We are delighted to provide fresh flowers and a complimentary welcome basket for each booking containing your first breakfast - fresh bread and butter, milk, fruit juice, jam, cereal, tea, coffee and fruit. The beautiful contemporary bathroom features a double sized 'couple' shower with body jets and rain head shower, heated towel rail, deluxe heavy weight 800gsm towels, velour bath robes and a heated (demisting), illuminated mirror - perfect for make up application. There's also an electric socket for shavers on the side of the mirror. We also provide luxury full size Cole & Lewis products for use during your stay – shampoo, conditioner, shower gel, hand soap and hand & body lotion. The master bedroom contains a deep deluxe 5ft King-size mattress and the second bedroom a deep deluxe 3ft Single mattress. Both mattresses are pocket sprung underneath for excellent lumbar support topped with memory foam for the ultimate in comfort. 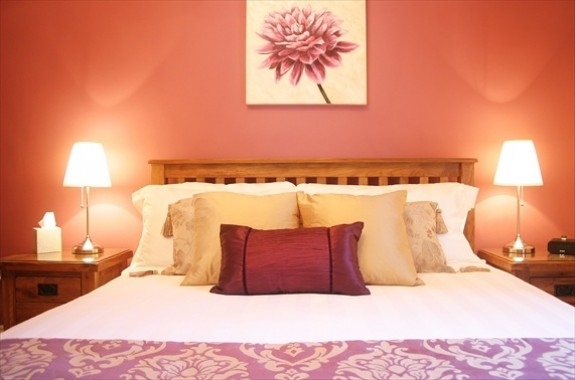 Both bedrooms offer a choice of pillows from the Pillow Menu, with options on bedding too. Beds are made up with 300 or 400 thread count white top hotel quality bedding which is complimented with decorative cushions and bed runners in keeping with the room decor. A double duvet bed set is in place in the single bedroom to ensure a high quality of comfort. All mattresses feature deluxe mattress protectors and the pillows all feature pillow protectors. 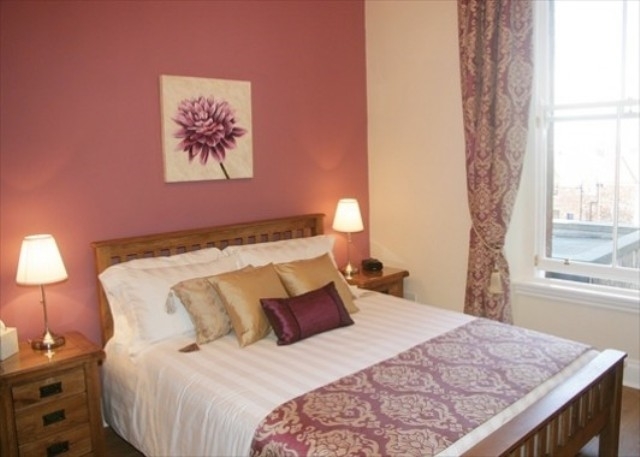 Both bedrooms offer Flat Panel HD TV and DVDs and radio alarm clocks with ipod docking stations. Both bedrooms are also fitted with black out blinds to ensure those long lie ins are not disturbed (vital during the summer months when the sun pops up long before most holiday makers). 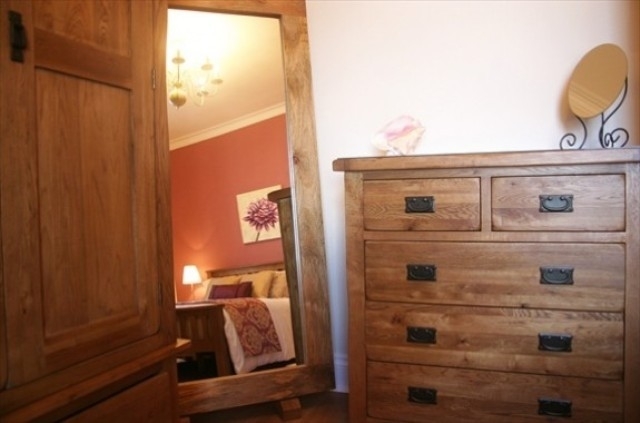 There is excellent master bedroom storage with 2 oak wardrobes and a chest of drawers. Both rooms feature full length mirrors. Hairdryers are also provided in both rooms. Overall, The Imperial Apartment is finished to a very high quality, the oak furniture and floorings are complemented with cream walls, white coving and original oil paintings of North Berwick scenes throughout. All paintings in the Apartment are for sale as are limited edition giclee prints of the works on display. All paintings are by Artist Tracey Pacitti, co-owner of The Imperial Apartment.